What is Content Strategy Governance and How Do You Plan for It? What is Content Governance and How Do You Plan for It? 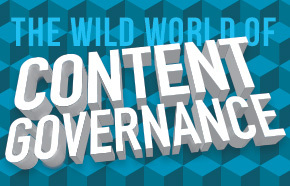 Governance is one of the most important aspects of content strategy. In this blog post series, we’ll explore topics related to producing content in the real world, where staffing constraints and conflicting department needs affect your perfect content plan. You’ve planned out your content for the coming season and you can’t wait to launch your new campaign. You’re going to run some great customer promotions, develop content around an exciting new theme, launch a new social media channel, and reach a brand new audience for the first time. But then things get real. The heads of four different departments come to you, telling you that they’d like you to feature 20 different products or programs on the homepage of your website at the same time. You realize that it’s going to be hard to juggle the launch of a new promotion with everything you have to do day-to-day. And your new assistant just sent a tweet that might give your customers the wrong impression about your brand. What do you do? Governance is a set of practices within content strategy that tries to deal with the realities of creating and publishing content in a real business environment. It defines how content is reviewed, who is empowered to make editorial planning decisions, and what to do after content — or an erroneous tweet — is published. Office Politics: What to do when too many people or departments want their programs and services to be featured on the homepage at the same time. Staffing and Budget Constraints: How to prioritize what you publish and what content channels you use to maximize limited staff time and budgets. What to consider when outsourcing your content development. Using evergreen content and best publishing practices to increase your time efficiency. Workflows: Best practices for determining who writes content, who approves it and who publishes it. How to adapt your content for different content channels, such as a desktop site, tablet app, a newsletter, and different social media channels. Social media response tactics. How to communicate quickly during a crisis. Taxonomies: Your blog features a sprawling list of tags and categories. How can you build a taxonomy that helps your customers find what they’re looking for? Editorial Guidelines: How to establish editorial guidelines to ensure that your brand is promoted consistently, that keywords are implemented successfully, and accessibility requirements are followed. Policies: Setting policies to define what’s appropriate, so you can empower others to work with your content channels, and know what to do if someone makes a mistake on social media. Setting guidelines specific to community pages, such as Facebook business pages, and user forums. Content Sprawl and Performance: Setting benchmarks, and reviewing content at regular intervals so that you can adjust, improve and hit your goals. What to do with old content. Each of these processes comes with its own set of challenges, but when working in tandem they can help you capitalize on one of your organization’s most important assets: its content.